Andrew Rowland and I had a nice, lengthy discussion concerning comics and art. We talked about AN ACT OF FAITH, the comic book industry, working in comics, and my teaching about the art of making comics. You can listen to the interview here or at YouTube. Comics Is Comics / "Wake Up and Draw"
Comics Is Comics / AN ACT OF FAITH #9 now on sale! 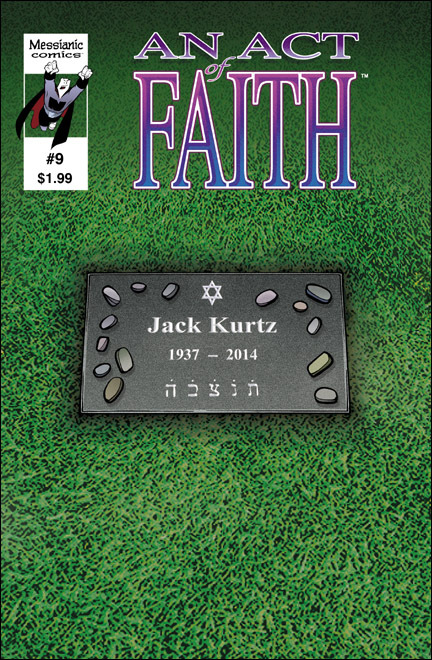 AN ACT OF FAITH #9 is now on sale at iVerse Media. I posted some preview pages to AN ACT OF FAITH #9. AN ACT OF FAITH #9 is the second half of the two-part 'The Ark' storyline. In the 1980s, there were two failed missions to find Noah's Ark. On the first mission, Professor Jack led the super-hero team, the Protectors. On the second mission, the Protectors went without Professor Jack. The second mission ended terribly. For decades, Professor Jack blamed himself for the failed missions. Now, in hopes to make amends, Professor Jack takes Nemish-Man, Crusader Girl, and Kid-Cockroach to Mount Ararat to retrieve Noah's Ark once and for all! Here's a photo that was Tweeted by someone during the "Creator-owned Comics (vs. Corporate-owned Comics)" panel of myself, Michael Allred, and Kurt Busiek. Special Edition: NYC was all about comics and seemed more creator-focused. Not too many publishers were there. I really enjoyed the convention. It was great speaking with Fernando Ruiz, Cory Smith, Kevin Maguire, Russ Braun, Eric Talbot, and Michael Dooney. The "Creator-owned Comics (vs. Corporate-owned Comics)" panel went very well. Plenty of folks showed up. Kurt Busiek , Mike Allred, and I discussed the possibilities of how digital comics and webcomics can be beneficial for creators (like not having to worry about printing bills and print comic book distribution). We talked about contracts, working with Hollywood, moving a property from one publisher to another, and how some comic book publishers frown upon their creators talking to one another. We chatted a bit about self-publishing and how time-consuming the business side of self-publishing can be. And I’m sure there were other things that we discussed… which escape me at the moment. Speaker(s): Kurt Busiek, Michael Allred, Al Nickerson. Description: There seems to be more and more comic books owned by the artists and writers that create them. We have Image Comics, Dark Horse Comics, and self-published comics. The creators that make such comics don’t have to answer to an editor. They can write and draw the kind of comic books that they want to write and draw. This is much different than the work-made-for-hire comics that are being published by the likes of Marvel Comics and DC Comics.